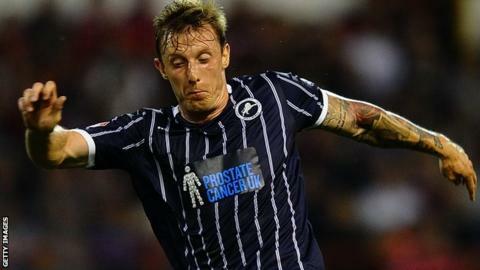 A stoppage-time goal from Martyn Woolford earned relegation-threatened Millwall a draw against Watford. Lewis McGugan combined well with Troy Deeney before putting the visitors ahead with a 20-yard shot. Steve Morison lashed in an equaliser from a tight angle, only for Almen Abdi's deflected shot to put Watford back in front with four minutes left. But the Lions salvaged a draw when Woolford struck home a left-footed shot in the fifth added minute. The result extended Millwall's unbeaten run to four games and left them just one point behind 17th-placed Charlton, who have two games in hand. Watford, meanwhile, are seven points adrift of the play-offs with five games remaining. Both teams were desperate for a win to help their respective end-of-season ambitions, and the game began at a frantic pace. Watford opened the scoring when McGugan's dummy allowed Deeney to back-heel the ball back into the path of the midfielder, who shot past David Forde for his 10th goal of the season. Watford could have doubled their lead moments later, but Forde was out quickly to block Deeney's close-range effort. Millwall responded well and got their reward when second-half substitute Morison volleyed home from the angle following Woolford's corner. Nicky Bailey then forced Watford keeper Manuel Almunia into a fingertip save with a 25-yard strike, before Abdi's deflected shot from the edge of the area put the visitors back in front. But Millwall were not done, and Woolford capped a spell of late pressure with a deserved equaliser. "I thought it was going to be one of those days," he said. "It looked like it was over, but I'm really chuffed with that result. "It looked like 'good night' at 2-1, but the great thing about this club is that they keep fighting and I hope the fans can be as proud of the players as I am. "If we can put a sequence together, we've got a chance. I need a strong set of players and I think we're growing. If you have got that mental capacity, you'll never surprise. Let's hope it's not too late." "It was a tough game to come and play in. Millwall need points so it was always going to be tough, but we should have scored more in the first half when we were on top. "What is disappointing is when you score so late yourselves and then don't go on to win the game. "It's difficult because when we need to step up our performance for the play-offs we come up short. Today's draw leaves a big gap to the play-offs, so it's difficult." Match ends, Millwall 2, Watford 2. Second Half ends, Millwall 2, Watford 2. Goal! Millwall 2, Watford 2. Martyn Woolford (Millwall) left footed shot from the right side of the box to the high centre of the goal following a corner. Attempt blocked. Shaun Williams (Millwall) left footed shot from outside the box is blocked. Corner, Millwall. Conceded by Daniel Pudil. Foul by Martyn Woolford (Millwall). Fernando Forestieri (Watford) wins a free kick in the defensive half. Corner, Millwall. Conceded by Manuel Almunia. Attempt saved. Martyn Woolford (Millwall) right footed shot from outside the box is saved in the bottom right corner. Assisted by Alan Dunne. Nicky Bailey (Millwall) wins a free kick in the attacking half. Foul by Almen Abdi (Watford). Corner, Millwall. Conceded by Joel Ekstrand. Goal! Millwall 1, Watford 2. Almen Abdi (Watford) right footed shot from outside the box to the bottom left corner. Assisted by Sean Murray. Attempt missed. Sean Murray (Watford) right footed shot from outside the box misses to the right. Assisted by Daniel Pudil. Attempt saved. Alan Dunne (Millwall) left footed shot from outside the box is saved in the top left corner. Sean Murray (Watford) is shown the yellow card for a bad foul. Jermaine Easter (Millwall) wins a free kick in the attacking half. Foul by Sean Murray (Watford). Substitution, Watford. Sean Murray replaces Lewis McGugan. Attempt missed. Simeon Jackson (Millwall) right footed shot from outside the box is close, but misses the top right corner. Assisted by Jermaine Easter. Attempt blocked. Jermaine Easter (Millwall) right footed shot from the left side of the box is blocked. Assisted by Steve Morison. Attempt missed. Scott Malone (Millwall) left footed shot from outside the box is too high. Attempt missed. Shaun Williams (Millwall) left footed shot from outside the box misses to the right. Corner, Millwall. Conceded by Marco Davide Faraoni. Carlos Edwards (Millwall) wins a free kick in the defensive half. Foul by Fernando Forestieri (Watford). Delay in match Gabriele Angella (Watford) because of an injury. Delay in match Mark Beevers (Millwall) because of an injury. Substitution, Millwall. Jermaine Easter replaces Stefan Maierhofer. Foul by Nicky Bailey (Millwall). Almen Abdi (Watford) wins a free kick in the defensive half. Attempt blocked. Lewis McGugan (Watford) right footed shot from outside the box is blocked. Foul by Mark Beevers (Millwall). Almen Abdi (Watford) wins a free kick in the attacking half. Attempt saved. Lewis McGugan (Watford) right footed shot from the centre of the box is saved in the centre of the goal. Assisted by Almen Abdi. Attempt blocked. Almen Abdi (Watford) right footed shot from outside the box is blocked. Attempt saved. Fernando Forestieri (Watford) left footed shot from the left side of the box is saved in the bottom right corner. Assisted by Almen Abdi.